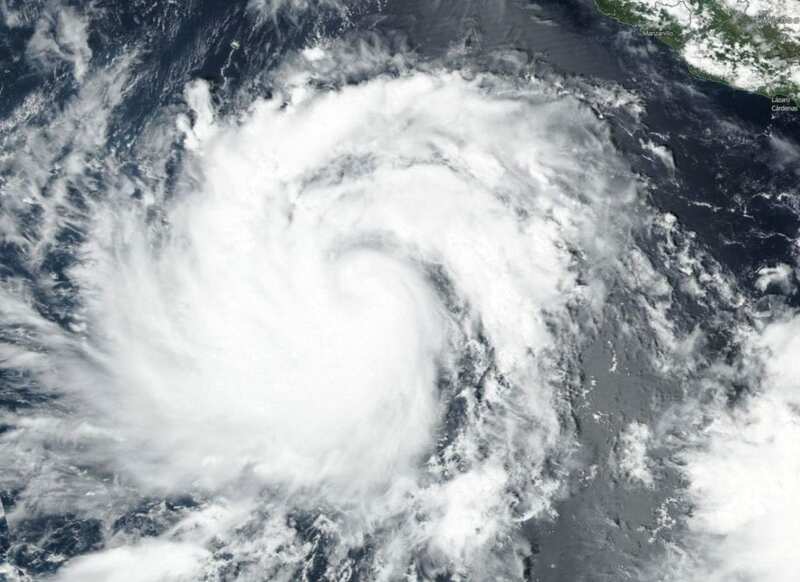 NASA-NOAA's Suomi NPP satellite passed over the Eastern Pacific Ocean as Tropical Storm Rosa was strengthening into that ocean basin's tenth hurricane. On Sept. 25, the Visible Infrared Imaging Radiometer Suite (VIIRS) instrument aboard NASA-NOAA's Suomi NPP satellite provided a visible light image of Tropical Storm Rosa. The VIIRS image showed powerful thunderstorms around the center of circulation and thick bands of thunderstorms spiraling into the center from the northern and eastern quadrants. At 11 a.m. EDT (1500 UTC), the center of Hurricane Rosa was located near latitude 16.1 degrees north and longitude 111.4 degrees west. That's 510 miles (820 km) west-southwest of Manzanillo, Mexico. Rosa is moving toward the west-northwest near 10 mph (17 kph), and this general motion is forecast to continue for the next two days. A turn to the northwest is expected by Saturday morning. Maximum sustained winds have quickly increased to near 75 mph (120 kph) with higher gusts, and rapid strengthening is forecast to continue through tonight.